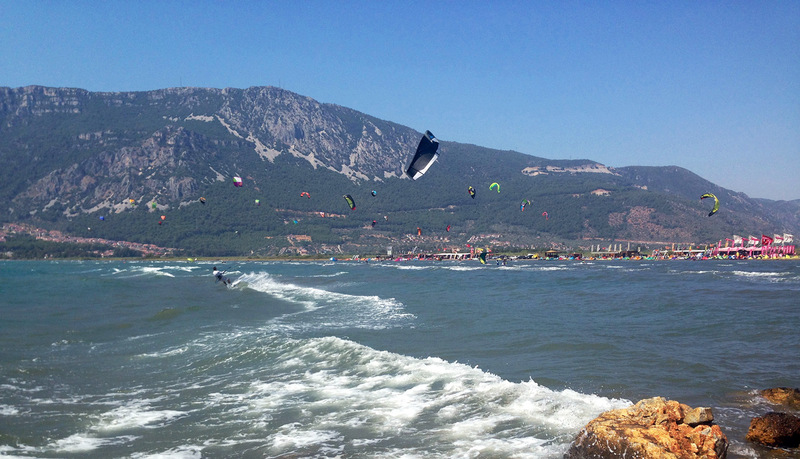 There are some kitesurf spots that keep being mentioned when talking about great kite surf holidays close to Europe. Gokova in Turkey is one of them. 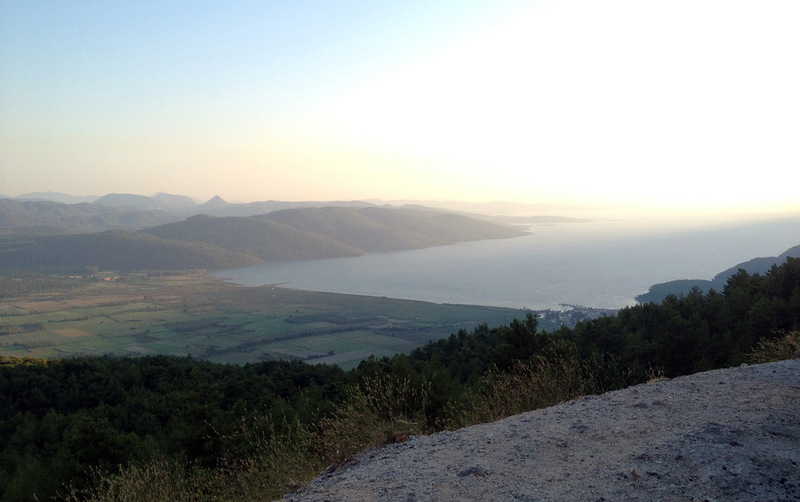 It had been on my list for a long time alongside Dahkla, Neretva and a few others. But since Asia’s friends live in the same area we decided to kill two birds with one stone this summer and visit both them and Gokova. We flew from London to Dalaman with Monarch. It’s cheap but be prepared to share flight with loud chavs if you go in the holiday season. Also, note that you might have to pay for a visa on arrival. For instance my Swedish passport went through no cost, but Asia’s Polish passport set her back £20. 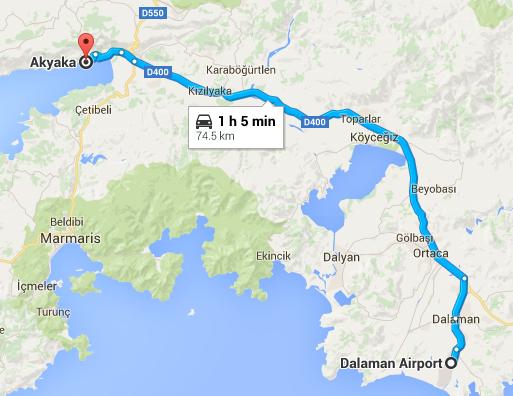 Dalaman is the nearest airport, about one hour drive from Gokova. We picked up a car at the airport but instead of going North we actually drove down South to Antalya to visit Asia’s friends living there. 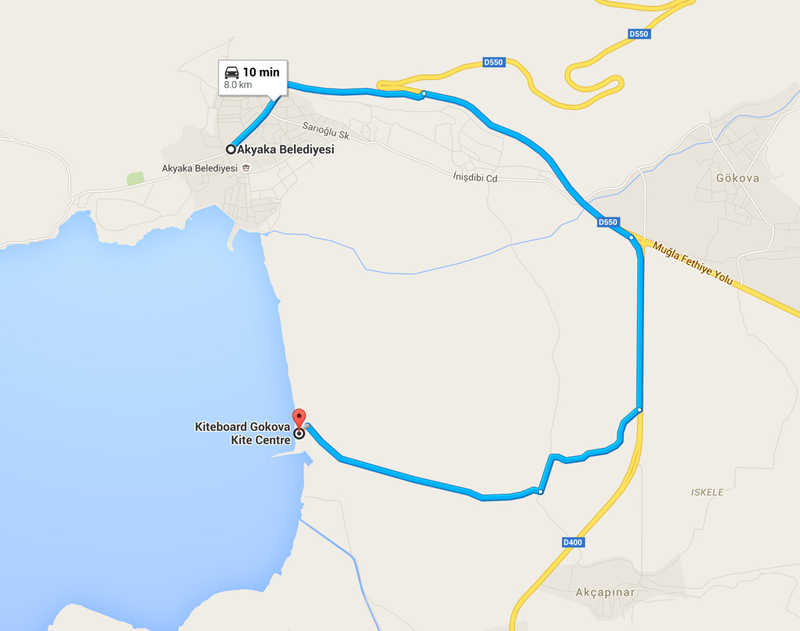 The drive between Dalaman and Gokova is pretty much along one road, so it’s a convenient spot to get to. I’m sure it’s possible to get to Gokova by bus as well, but save yourself the trouble and pick up a cheap rental car that you can use for the daily commute to the beach as well. 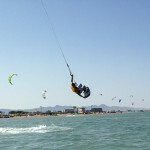 This is where most people kitesurfer stay, mainly because it’s balance of pulse and accessibility. 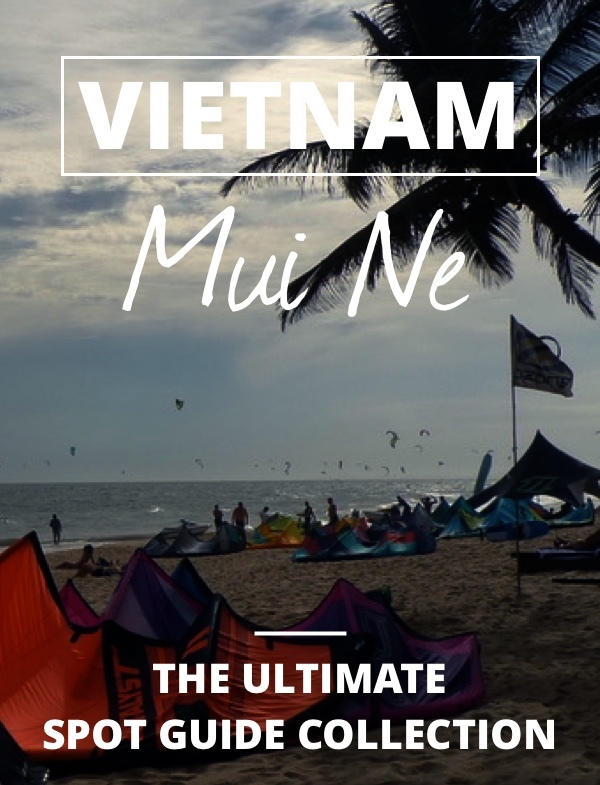 It’s a pretty sleepy village, but it’s beautifully located on a slope by the water and there are enough restaurants and bars to keep you busy. There are also a couple of supermarkets if you’re staying in a place with self catering. This is what we did, as there are plenty of good value AirBnB flats available. Everything happens on the bar street, and down by the water so it’s very easy to get around in the evening. 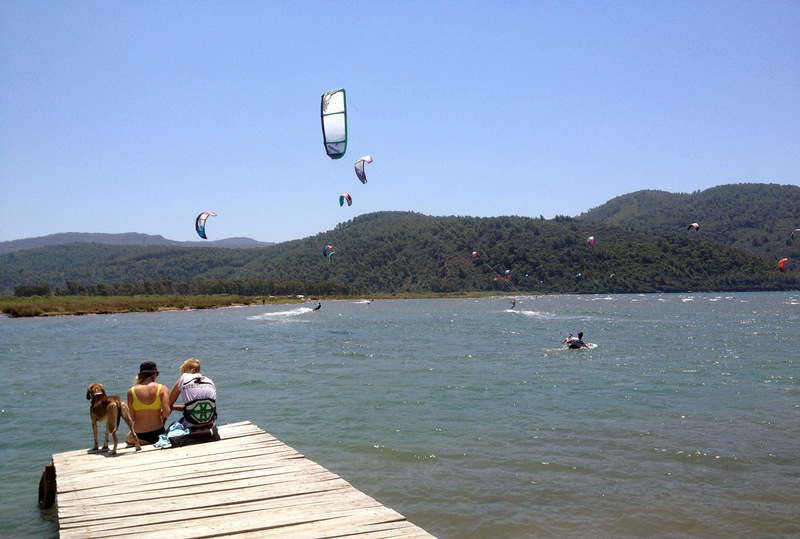 You’ll find some kitesurf bars on the right hand side of bar street. We stayed up on the hill with a view to the kite beach. Any kites up yet? Ok, let’s go! 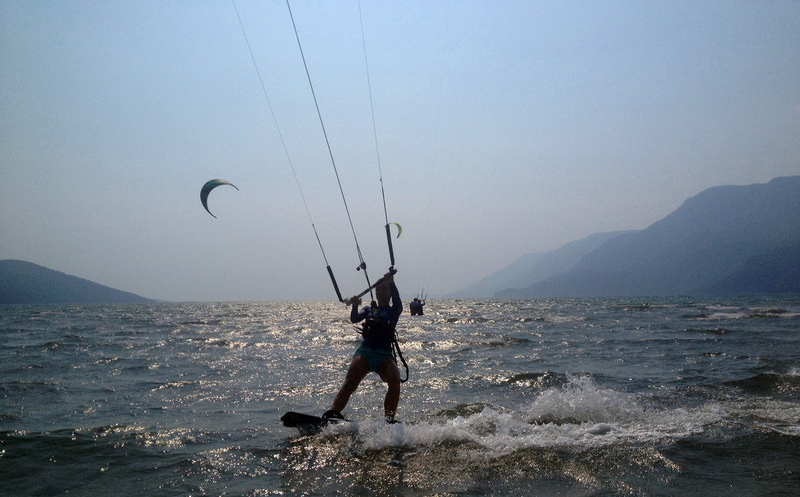 This could be a better option if you’re in a mixed group kiters/non-kiters, or if you want more action in the evenings. Marmaris is internationally known as a beautiful resort and hosts a lot of tourists, and clubs, bars etc to accommodate for them. 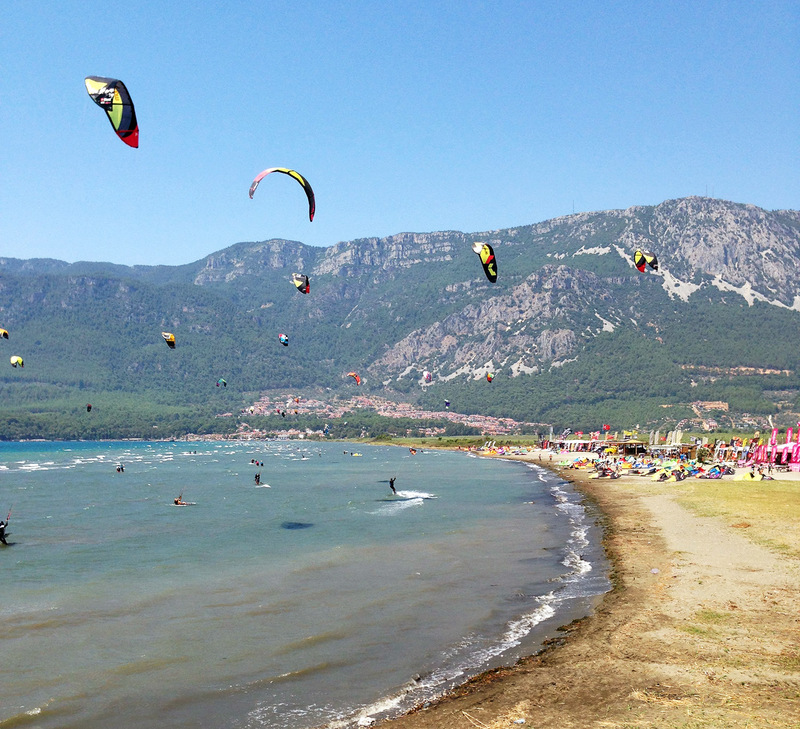 You can get really close to the kite beach if you want by staying in a nearby village, but then you won’t do much other than listening to fighting cats in the evenings. 1. 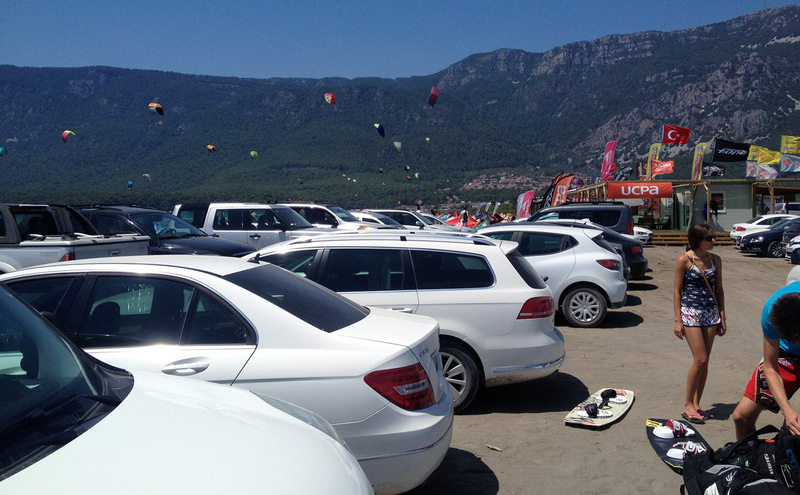 Parking, beach and kite centers. 2. The teaching is taking place right in front of the centers. 3. 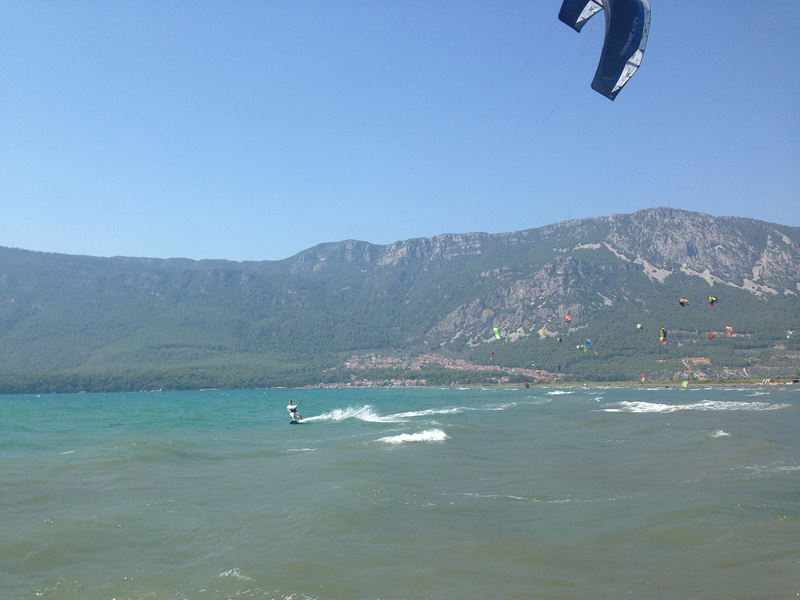 A bit closer to Akyaka it gets less busy but still a lot of beginners practising here. 4. A lot of bathers over here, and also the wind is much weaker. 5. Upwind of everything you have as much space as you can ask for but also deep water and a lot of chop. 6. On this side of the “pier” is more wind, more advanced riders and less busy. 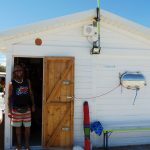 You have to pay for beach access, which includes parking and access to toilets and showers but 20TL per person per day is not peanuts if you’re staying for some time. There are two ways to get away cheaper. 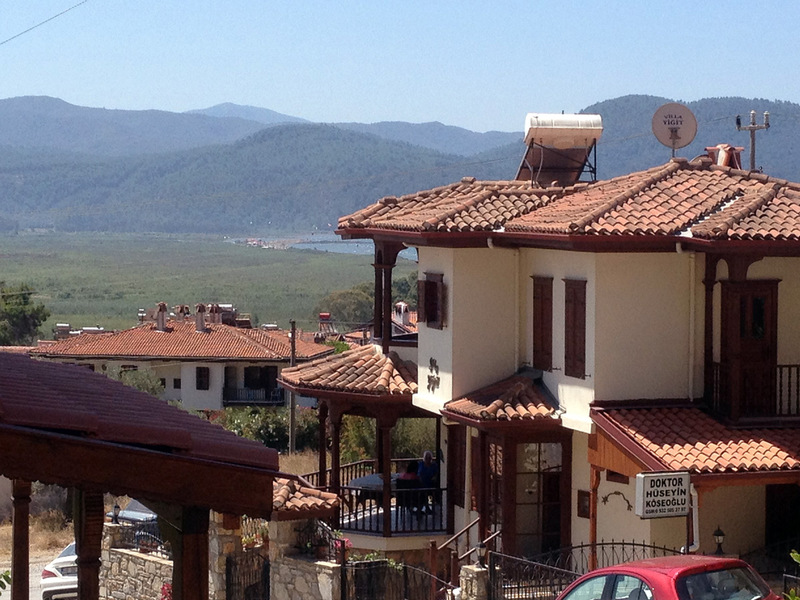 One: Pay for 10 days at once for 100TL per person and save 50%, or Two, walk along the shoreline from Akyaka and save 100%. 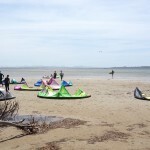 Maybe if you got your gear in a storage at one of the kite centers option Two is worthwhile but we chose option One and were happy with the discount. The parking lot can get well busy so arrive around 11 for a good spot. But they are more or less the same anyway. 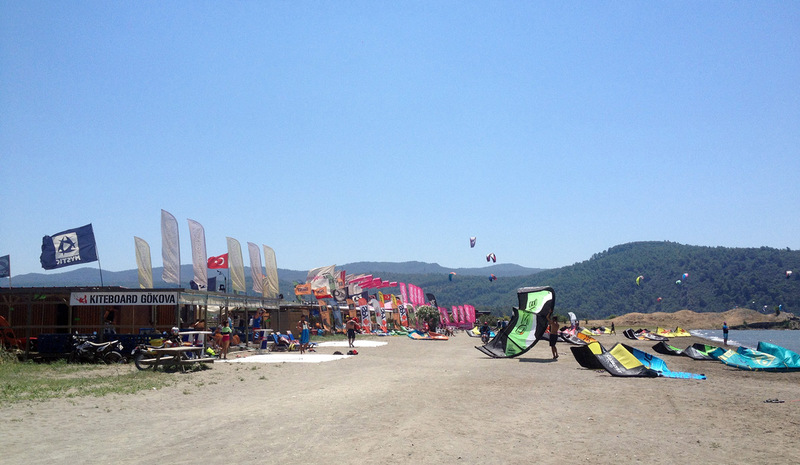 There are a lot of kite centers/schools. Not sure how many but at least 6 of them lined up side by side. With that many schools there are obviously a lot of teaching going on in the water. 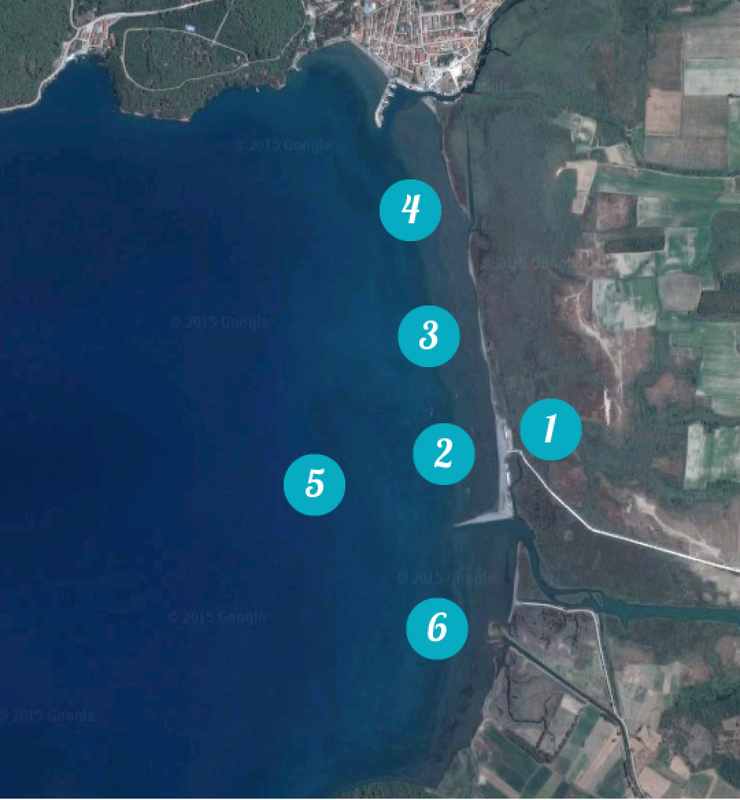 Lessons take place in the area in front of the schools, and continues towards Akyaka. 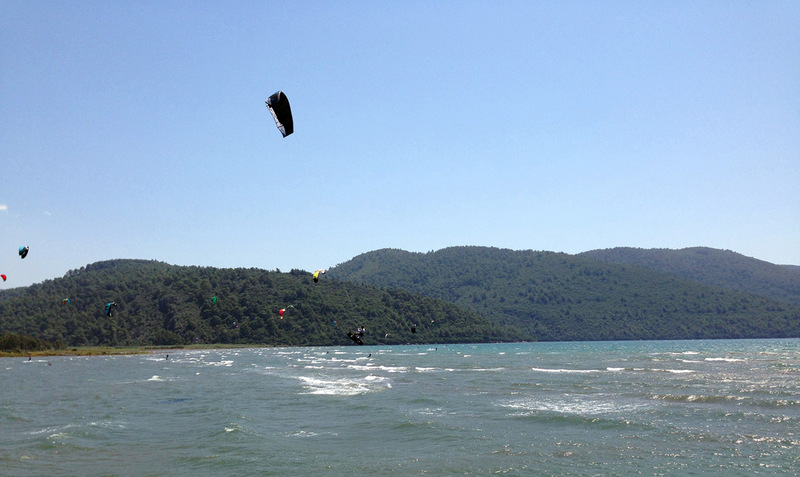 Wind is pretty much onshore, so getting out past the students can be a bit of a hassle but once your upwind of them you have a big playground with few kiters around. Finding place to launch and land was never really a problem and there was always some friendly person around to help you. Most intermediate and advanced riders ride on the right hand side of the pier like bank at the far right side of the beach (viewed from the sea, facing the beach). 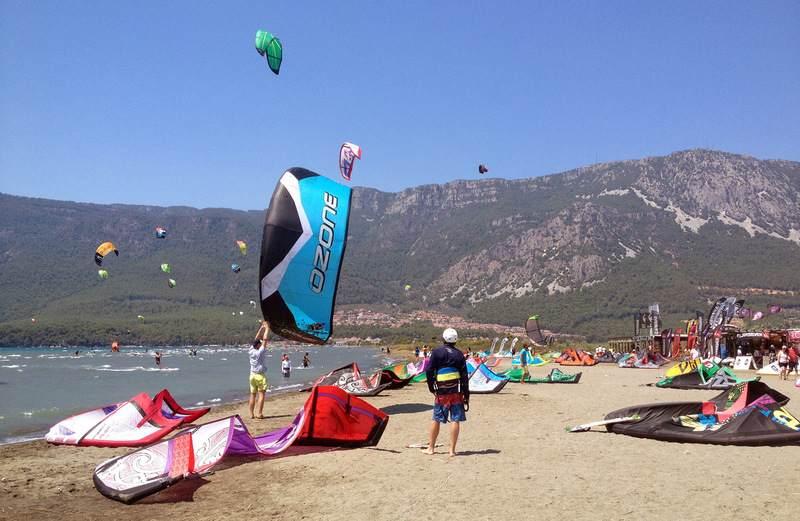 It’s windier there and a lot more space per kite. If this is where you want to ride you can launch on the beach and walk straight to this side without having to pass upwind of the “pier”. The beginner side is busy close to the beach. It’s a lot less busy on the other side of the pier thingy. This is hands down the most wind consistent spot I’ve ever been to. Because of the thermal wind that blows in from sea and funnels through the valley you can be sure to have wind as long as it’s sunny and hot. The wind works like clockwork. A steady nice breeze kicks in around 11:30, builds up for a few hours and starts to drop around 4:30. Some days I could ride until 7pm, other days the wind was gone by 4:30pm but overall it is a very consistent pattern. Usually I would start on my 15m, ride it for 1 hour, then change to 11m between 1 and 3pm, and then swap back to 15 in the late afternoon. Asia did the same with 7m and 11m kites. A lot of girls were riding 9m all day, and a good size for men is 12m. All in all it’s a good spot, but not great. It’s not as flat as promoted. 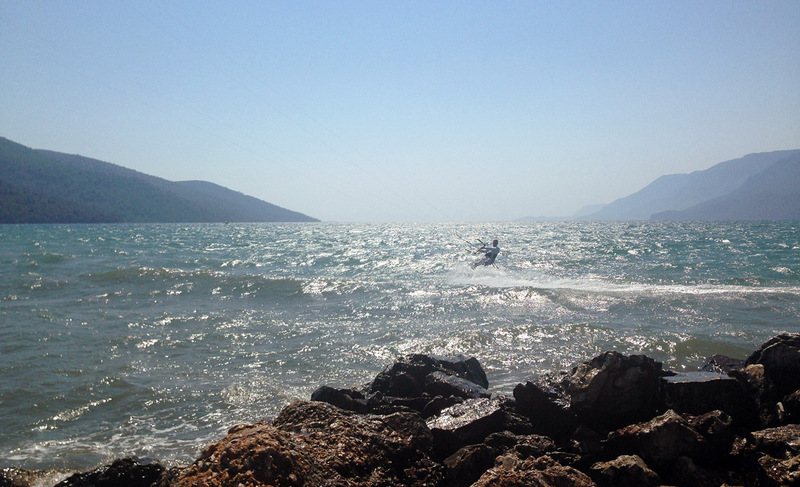 Actually it’s quite choppy unless you’re close to the shore, but there you have all the beginners. 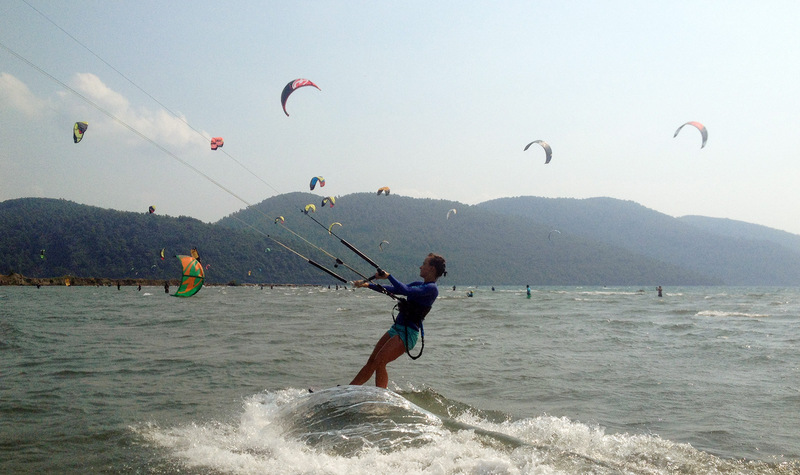 It’s not that great for beginners unable to stay upwind either as they’ll never get beyond the mess of students and instructors. 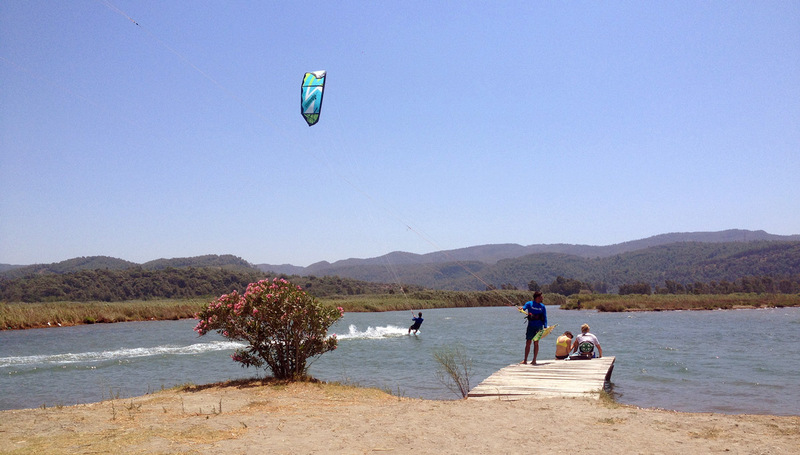 It’s probably best suited for intermediate riders who want to cruise, jump a bit and enjoy the warm water and beautiful scenery. Gokova also gets major plus points for its wind consistency. 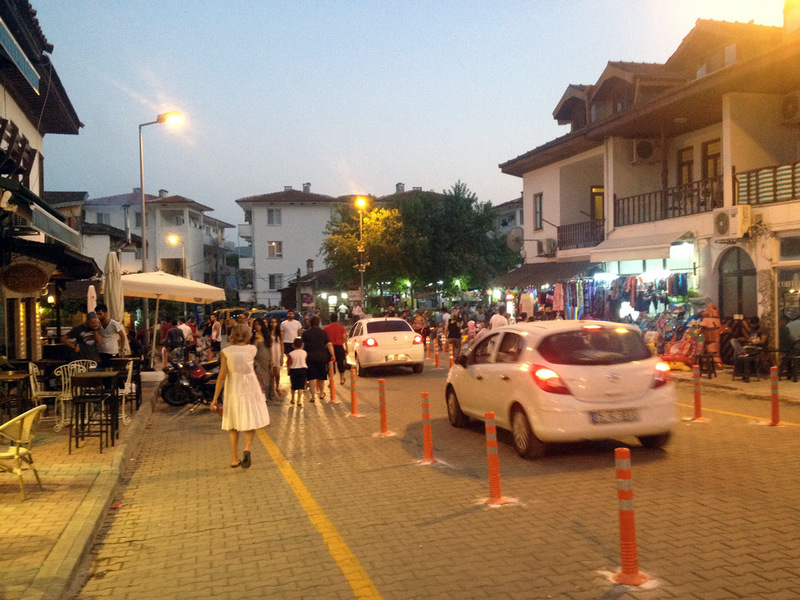 Trendy cafe and restaurant became a favourite in Akyaka. Follow the path North along the beach to find it. Take a haircut with great service for only 15-25TL. 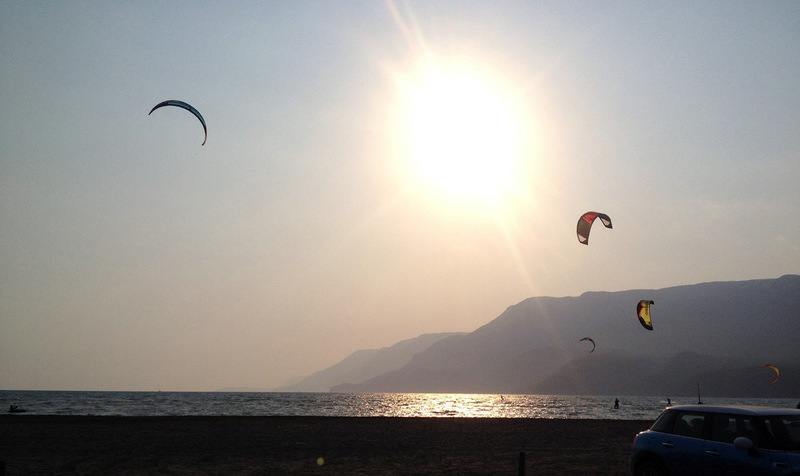 Avoid the rookie mistake of leaving kites in a hot car all day, creating leaks in the valves. By the end of our trip all 3 kites were leaking. Be aware of crazy driving. They tend to be bad with signalling etc. To come back to Akyaka from kite beach, we found the easiest way was to take a right when the little dirt roads split (it says no left turns but most people ignore this), but instead of going on D400 towards Marmaris you go under it and into Akcapinar, turn right and you’re soon back on D400 but on the right side towards Akyaka. Thanks for the review!!! Really informative!! Keep them coming!! Thank for such a good review! !